Deciding whether you should invest in brand new Jacobsen golf course mowers or make some savings by buying used turf equipment, creating annual golf course plan, employee supervision, ensuring playability of the golf course and there are many other duties and responsibilities of the superintendent. 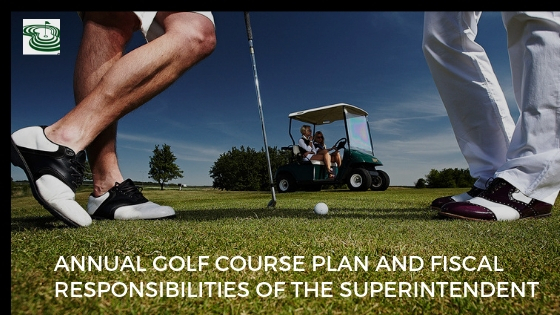 In this article, we will cover the role of the superintendent in annual golf course plan and his fiscal responsibilities. What are the fiscal responsibilities of the golf course superintendent? The process of budgeting includes the establishment of a financial operating and capital plan for the next fiscal year. The formulation of the budget is a strenuous job. This involves several important inputs such as past history, knowledge of upcoming events and benchmarks and goals to be achieved in the future fiscal year. After getting the budget for the next fiscal year approved, the superintendent will compare the actual monthly performance to the budget. The superintendent will intervene if intervention is necessary to achieve the goals. As it is the largest golf course maintenance operation expense, it is important for the superintendent to control payroll costs. The superintendent can make use of the Departmental Payroll Summary and the Pay Period Summary Report to compare actual and budgeted payroll costs. This is not possible without accurate and up-to-date departmental payroll cost data. Setting schedules to meet forecasted business levels, following timekeeping procedures and tracking payroll expenses is important to get correct data. This will also help in ensuring that the budget is not exceeding. These expenses include other departmental operating expenses. The superintendent should carefully review weekly and monthly expenditures to control these costs. It is also important to monitor these expenses. Jacobsen golf course mowers, aerators, utility vehicles, supplies, materials, equipment and tools and inventories for the department, whatever is required, it is the superintendent’s job to purchase. Being familiar with club purchasing policies is important for the superintendent to fulfill these responsibilities properly. A superintendent with good business judgments can maintain the right levels of inventories to balance the business demands, perishability of stock, controlling pricing for bulk purchases and availability of space in the warehouse. In order to keep the inventory secure, the superintendent should make sure that only a few individuals can access the inventory. Keeping the storage areas clean and organized will prevent any kind of damage and also make the inventory easily accessible. It is the superintendent’s job to code invoices to the appropriate expense accounts. This should be done in a consistent, accurate and timely manner. It is the superintendent’s responsibility to protect and care for all the assets in his department. The superintendent must follow club internal controls requirements to ensure the efficiency of his operations and operations and security of assets in his department. The superintendent must be familiar with, follow and recommend necessary changes in all accounting policies and procedures.